set 2 repellents against flies and mosquitoes Bio Veredus Repel Spray. 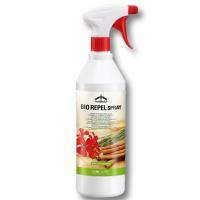 In 1 liter bottle with spray nozzle, made from essential oils of lemongrass, geranium and cinnamon. Non-toxic, because it contains only natural extracts. Suitable for frequent use, creates a protective barrier on the mantle of the horse.